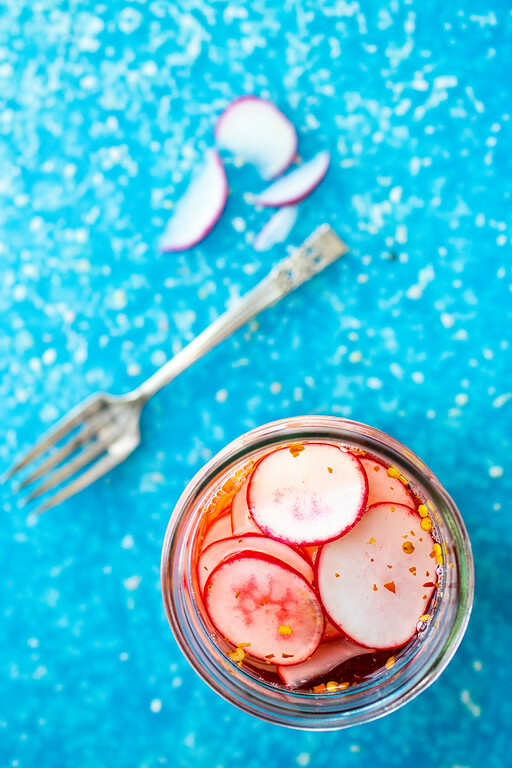 Quick Pickled Radishes are so easy to make and so wonderful to have in the fridge. Crisp, tangy and a little spicy these refrigerator pickles are great on salads, sandwiches, an appetizer tray or even to snack on! No canning involved! I made these quick refrigerator radish pickles first back in 2010! I’ve been making them regularly ever since then, but finally got around to updating the photos and this post! I adore quick refrigerator pickles. Quick and easy and they extend the life of your veggies, there is no hurry to eat them right away. As a matter of fact, depending on the pickle, they need to sit for a few days to a few weeks (in your fridge) before you eat them. Plus, they usually stay good for a couple of months, while you nibble on them as needed. I use them all the time as quick garnishes, or a snappy side dish, or crunchy snack. Let’s talk about what you need to make these quick pickles. Only 3 ingredients for the basic recipe, but there all kinds of options. Radishes – I used regular old garden variety radishes for these. They will eventually turn your pickle solution pink and the radishes take on an overall pink color. Vinegar – I used rice vinegar, you can use any of your favorite vinegars. Apple cider would be good. Sugar – I used white sugar. Ginger – finely chopped ginger (about 2 teaspoons) – especially nice for garnishing Asian dishes. Red Pepper Flakes – 1 teaspoon – adds some spiciness. Herbs – try your favorites – mint, basil, oregano. Step 1 – thinly slice your radishes, you can use a Mandoline or by hand. Step 2 – add vinegar to jar. Step 3 – add sugar to jar. Step 5 – whisk until blended and sugar as dissolved. 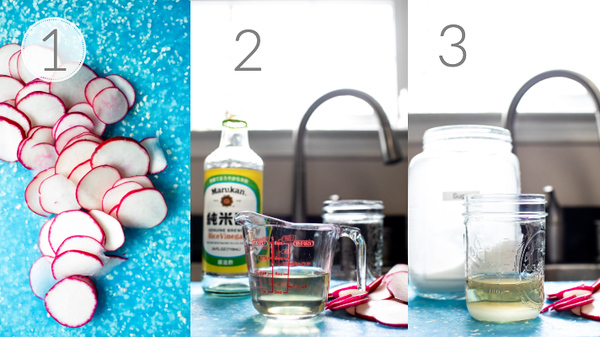 Step 6 – add radishes to jar, put a lid on them and store in the fridge. 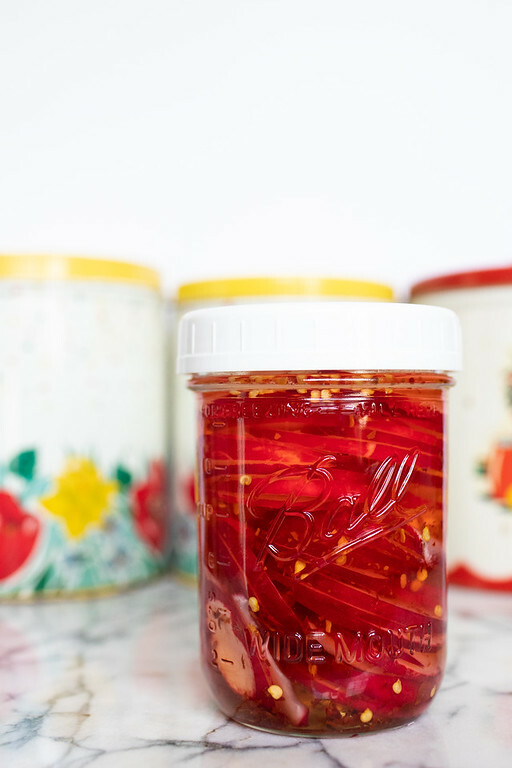 Refrigerator Pickled Radishes are so Good! I got the idea while glancing through The Complete Book of Small Batch Preserving. They used ginger and dill together, which sounded interesting, but I wanted mine spicy and not flavored with ginger or dill. They also state that you should only make these about 2 hours before serving because the color bleeds. If you’re doing these for an appetizer tray for a party, keep that it mind. I just make a jarful and snack on them all week. I’ve been eating these all week and will be starting another jar as soon as these are finished. I’ve had them in salads, on top of fried rice and even had with my sandwich and chips like you would a pickle. Yummy! If you’re looking for even more canning and preserving recipes, be sure and follow my Canning & Preserving Pinterest Board. Ready in about 2 hours and even better the longer they sit, these are crisp, tangy and a little spicy! Great on an appetizer tray, sandwiches, salads or even just for snacking! 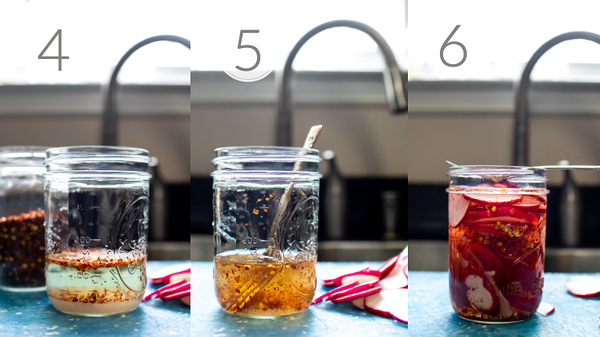 Add the vinegar, sugar and red pepper flakes to a jar. Stir or whisk until the sugar has dissolved. Put radishes in jar. If they aren't completely covered by the liquid, add more vinegar on top until they are covered. Put a lid on them and store in the fridge. They are ready in as little as 2 hours. Ginger - finely chopped ginger (about 2 teaspoons) - especially nice for garnishing Asian dishes. Red Pepper Flakes - 1 teaspoon - adds some spiciness. Herbs - try your favorites - mint, basil, oregano. Note: these will keep in the fridge for 3-4 months, though they are best when eaten within the first month. Update Notes: This post was originally published in 2011 and has been update in 2019 with new photos, recipe and notes. Pinning! These look delicious, Pam, and I love how easy they are to make! Perfect for a gift and add a little zip to any sandwich or salads. I don’t often get to eat radishes, so I like that this is a tasty and easy way to get more in my diet. These are very versatile and can be used in a variety of ways. I don’t eat them much either, except like this! This looks so tasty and so easy Pam! I wan’t wait to try them! I think I’m going to use fresh ginger or dill! I’ve used the ginger before, so good! I love quick pickled veggies! This is such a great idea! Can’t wait to try it. What a great idea! I will have to do this so I have some readily on hand! It’s great to have a jar of them in the fridge! It’s one of the easiest way to store radishes and preserve its taste. Yum! My garden is exploding with radishes…I’m definitely going to have to try this! Why Pam, daaaahhling, I hadn’t even noticed. I’m am so into food in jars! I’ve been wanting to pickle radishes. These look fantastic! YUM! Hubs would go crazy for these…he’s a radish-LOVER!! I think only in my conversations with myself do I ever respond with one word answers. Michael Symon has gotten me intrigued by quick pickling. I think this would be just about the only way you could get me to really like radishes! Well they look beautiful, no not boring. Love the rice vinegar to pickle. Why didn’t I think of that? 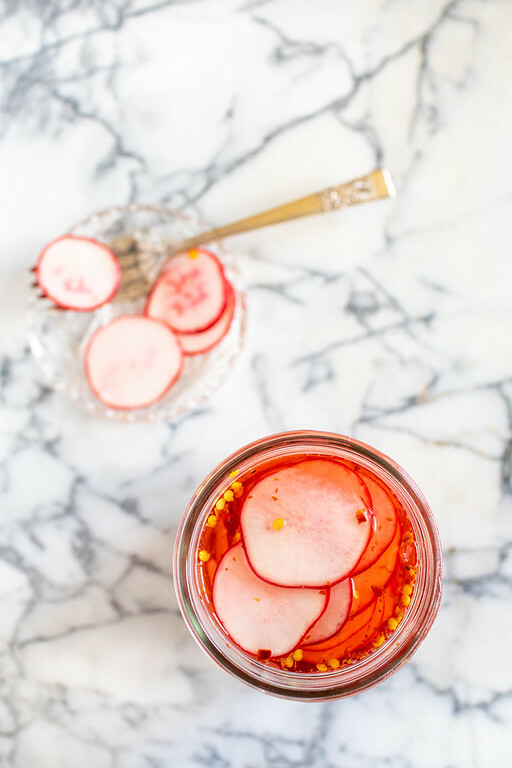 I had no idea you could pickle radishes. And I converse with myself all the time. It’s one of the reasons that I’m so smart because two fictional heads are always better than one. As you know, I have a facination for looking at home made canned goods. I open the pantry on a regular basis to look at my handiwork. I’ve never had pickled radishes but they sound and look great! I’ll have to try the recipe! I thought you just posted a post? on the pumkin seed pesto.n I was baffled when I came here to check out the pumpkin seed pesto recipe because I have the cilantro n pumpkin seeds in my food processor right now ready to whizz.Just came here to check the recipe to make sure I got it right. ANd then i see this new post. WOW.anyway those radishes are really pretty. Yes I wld open the cupboard just to stare at them. everyday. now back to my…(your) pumpkin seed pesto. I’ve had a book on canning sitting on my shelf for…well, so long I can’t remember how long. One of these days I am seriously going to use it. You inspire me. And is that a new header I see. Me likey. I love to munch on radishes and can’t wait to try this, Pam. You’ve added so much flavor with the ginger and rice vinegar. we’ve been getting abundant radishes from our local CSA. usually i just put them in salads. this looks like a good idea for my next bunch. thanks! Never thought to make pickled radishes! I have some in the fridge, too, so must just whip this up. Not the tinyest bit boring. Another Friday’s Fav! I’ve done a little of it, but my sister in law makes a sweet pickle spear with a cinnamon stick in the jar…I’d kill for these! There’s nothing wrong with pretty food in jars, especially at the beginning of a holiday weekend, when you are supposed to be holidaying, and not working! I love quick pickles and seldom have the patience for canning. But I’ve never tasted pickled radishes. They are beautiful and illnbet they have a very fresh flavor. I think I will make this as a labor of love for Mr. Hip. I don’t like radishes but he does. I could polish off this whole jar. My affinity of radishes grows.